BTS JIN's Fishing Fail! Where is this? And What is that Boat?? 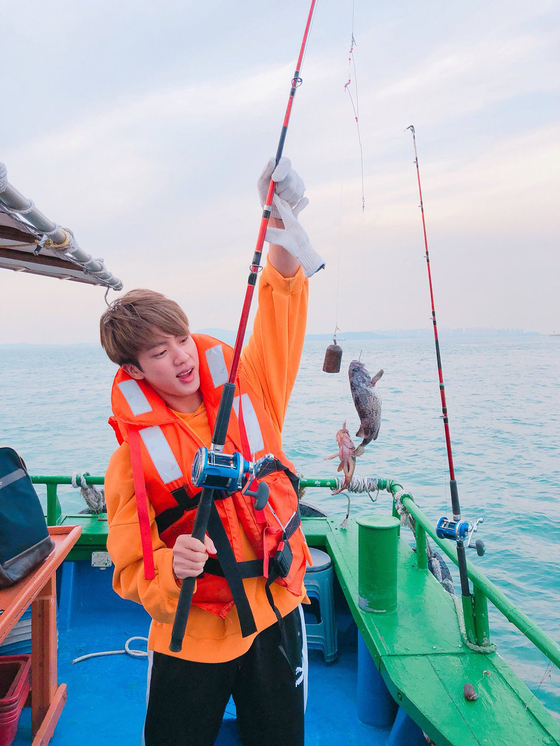 It is no secret that BTS's eldest member Jin loves fishing. 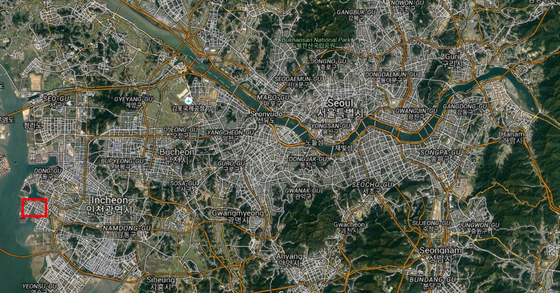 Last year on November 26th, after finishing their concert in Osaka, Jin took Yoongi, a well-known home-body, and went fishing. 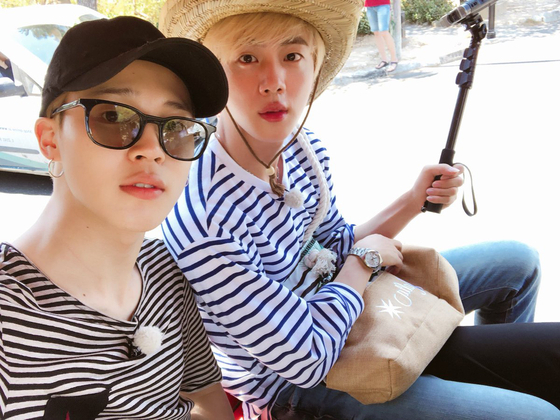 The two boys have been fishing together before on an episode of Bon Voyage. 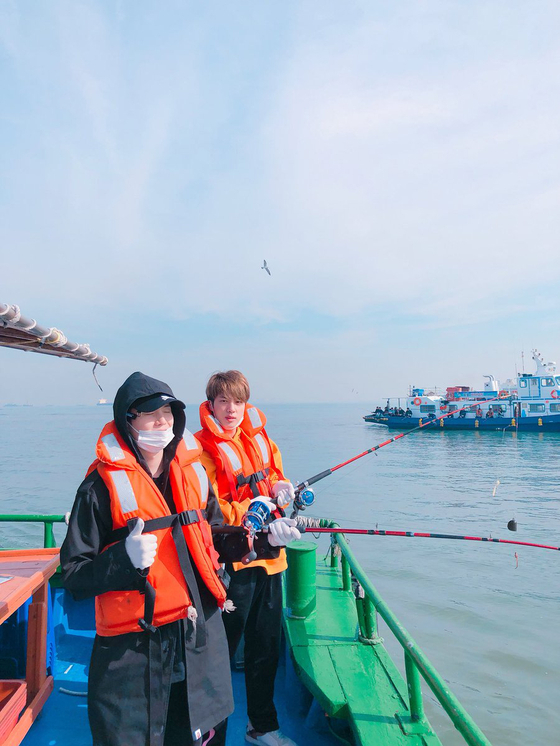 It looks like even the home-body Yoongi likes going out to fish with Jin hyung! They enjoy fishing so much that they even decided to spend their precious free time during a long-awaited break going out to the sea to fish. 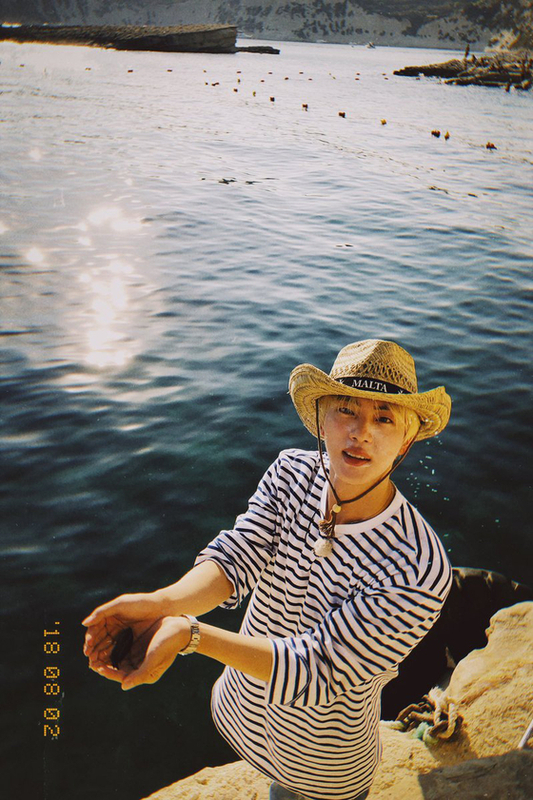 Late last year on December 3rd, Jin's birthday, Jimin even uploaded a picture of Jin fishing back in the summer in commemoration of his birthday. Jin even tries fishes in sleeping Jungkook's mouth using his tie! It appears that Jin went to go fishing one more time recently. 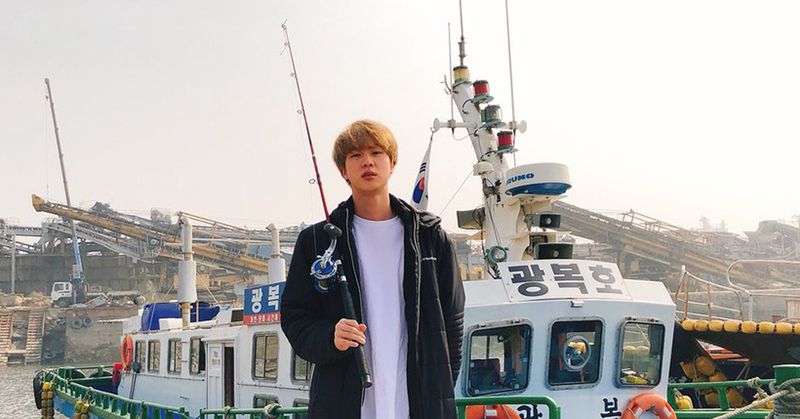 On March 5th at 1:16 am Korean time, Jin uploaded a picture on the BTS members' official Twitter of him holding his fishing rod in front of a boat along with the comment, "I couldn't catch a single one." Whether or not it was because he was unable to catch a fish, his slightly pouty expression brought smiles to the faces of those who saw him. Based on the hazy, grayish skies, it seems likely that he went fishing recently, as the past five days or so in Korea have been heavy laden with fine dust. 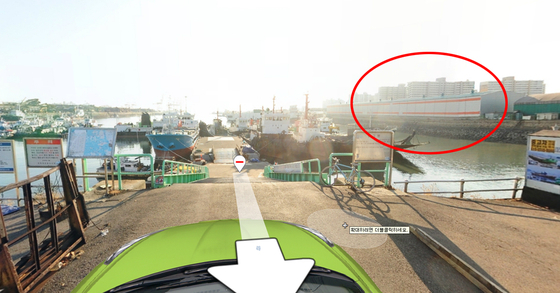 But where is this location, then? VoomVoom has concluded that this picture was most likely taken at Incheon Namhang Pier. Incheon Namhang Pier (the red square) is a popular place for sea fishing that is 25 km away from Seoul. 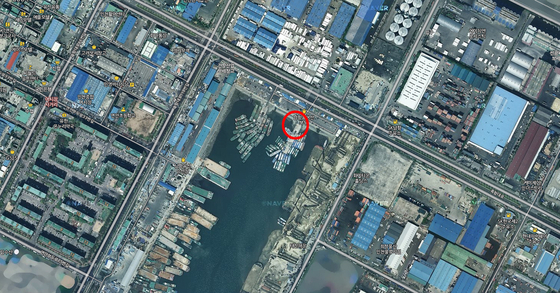 This satellite photograph is an enlarged photo of the pier. 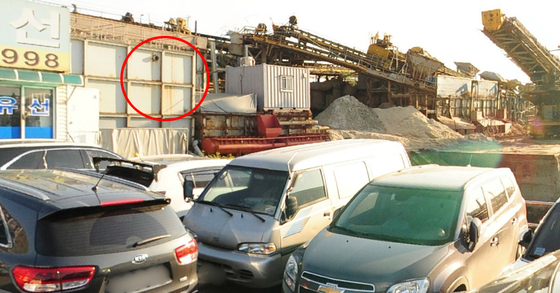 The area where it's marked with a red circle is thought to be where Jin took the photo. He is speculated to have taken a boat called "Gwangbok-ho" to enjoy sea fishing. What is seen in the background of the photo is almost identical to the things that are seen in the photo of the pier. Even though the photo of the pier was taken in November, 2017, they still look highly similar to each other. 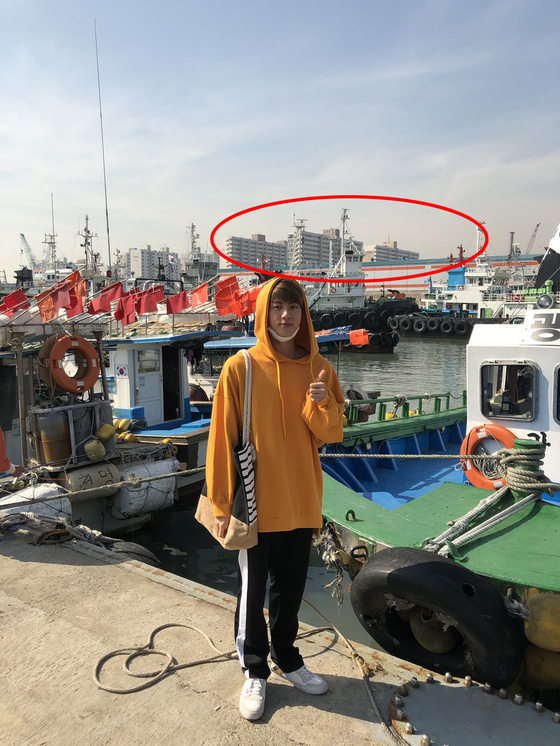 Considering the composition of the photo, the spot that is marked with a yellow oval is assumed to be where Jin took the picture. This isn't actually the first time that they took the photo at the pier. 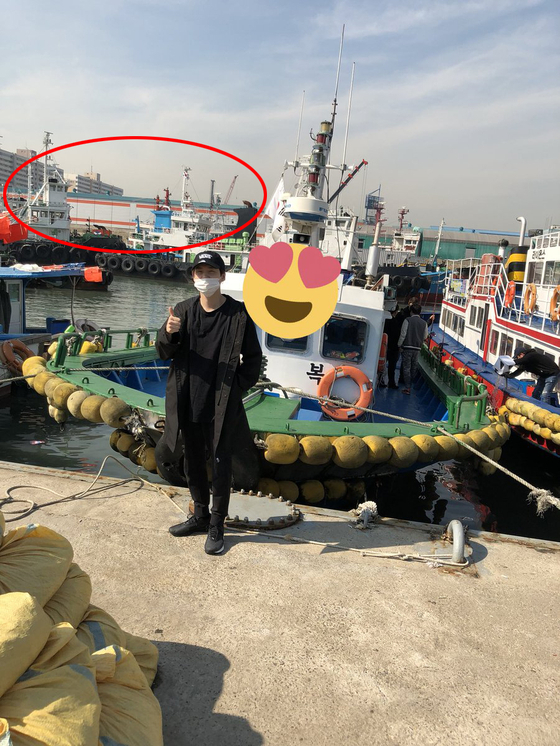 The place where Jin went to sea fishing with Suga last November was also Namhang pier. If you take a look at the apartments on the opposite side and the structures below them, you can definitely tell that it's the same location. 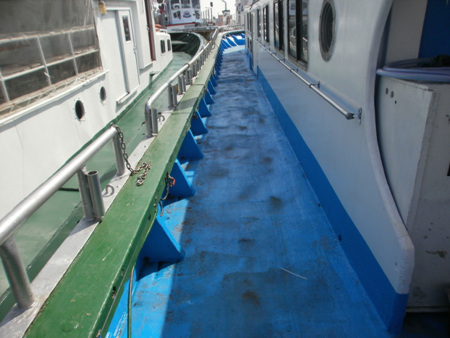 The boat they took to fish is also presumed to be Gwangbok-ho as you can tell by the colors of the floors and the railings in both photos. Gwangbok-ho provides service that allows you to roam around Incheon Daegyo and Palmi-do while sea fishing. It also goes to Deokjeok-do, Pung-do, and Gureop-do for sea fishing as well. 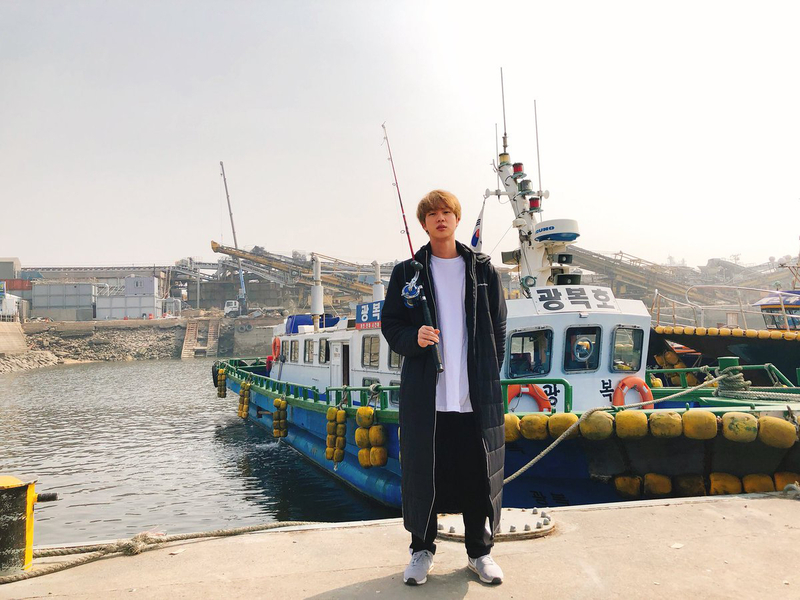 We can tell that Jin sure loves fishing to a point where he goes out of his way to sea fish when other people are just stuck in their home because of fine dust. Why don't you try sea fishing at Incheon Namhang pier just like Jin did when you come to Korea?